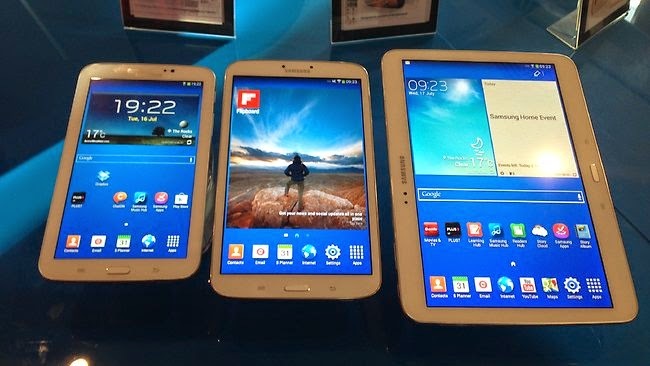 Similar to mobile phones, more and more people are now getting their own share of Samsung Android tablets for use on different things in everyday life. Android tablets in are entrenched with various features and functionalities, from photo/video capturing to recording of different files. Nevertheless, people should note that there are high chances of losing data from these devices, either by accident or not. But thanks to the Android Data Recovery software, it would now be easier for any Samsung tablet users to recover lost or deleted photos, videos, audios, text messages, contacts and other data directly from their Android tablet or from an SD card. Simply download the Android Data Recovery app version (free download here) you prefer to use and get started with file recovery on your Android tablet. The first thing you should do is to install and run the Android Data Recovery application, then go on with the first step. 1. Connect your Samsung tablet to the computer with an available functional USB cord. 2. Turn on or enable USB debugging on your Android tablet. 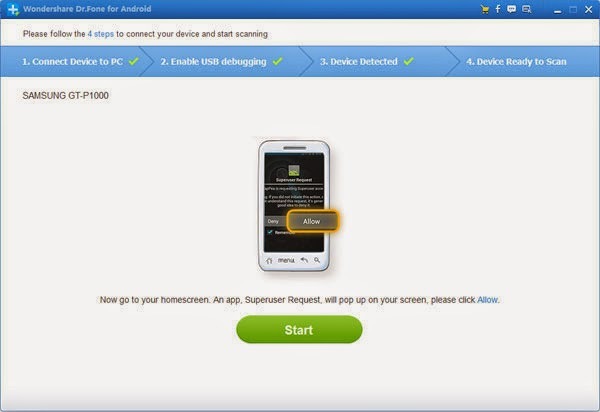 Typically, the software will initiate search for your device and then prompts you to enable USB debugging on your Samsung tablet, after connecting both devices. * Put a check mark next to USB debugging option. * Get to the Settings menu. * Click “About Phone” to continue. * Tap on the option that says: "Build number" for several times until you are prompted with a message saying, "You are under developer mode"
* Go back to Settings. * Put a check mark next to USB debugging. 3. Initiate/start scanning for your lost data/files on the Samsung tablet. When USB debugging is currently running or active in the background, you will directly be taken start scanning data on your tablet. Just tap on the Start button located on the Home screen to initiate the process of analyzing your lost data. Ensure your tablet has enough battery (preferably over 20% charged) before you start scanning the device. 4. Wait until you will see the image below, then click "Allow" on your tablet's screen to let continue the scan process. 5. Click the Start button on the program's window. 6. Preview files you wish to recover such as SMS, photos/videos or contacts from your Samsung tablet. Locate and select the file(s) you want to recover and click the "Recover" button to restore selected files. The aforesaid procedures are also application to recover lost data/files via Android Data Recovery too on any other Android tablets.